How was the idea of this documentary born? The war in Ukraine that broke out after the coup staged in the beginning of 2014 provoked reactions in Bulgarian society. 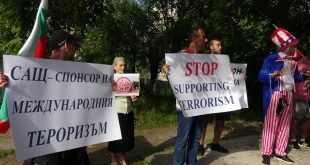 Protests in support of peace and against the hostilities opened on Donbass by Kiev have been organized for more than a year in Sofia and other towns. Despite the large scale protests, the official public media tendentiously did not cover them. Instead, most of the media gave tribune only to the supporters of the Maidan policy. On the other side, all willing to get informed of the war, could rely mostly on the Internet information: reports and news in Russian, English and other foreign languages. Thus, due to the official media blackout and propaganda, many people in our country remained uninformed of the heavy war consequences for the civilian population and of the resistance aims in Donbass. How was the documentary made? It was in these circumstances in the spring of 2016 that the idea for making a documentary arose. Decision was made that it would be most valuable to report on the voice of the common people in Donbass and through them to tell about the events that were going on. For the purpose, Ekaterina Mitrinova, the documentary maker and a cameraman left for the region at their own expense. They came back safely with many reports. These very reports from Donetsk People‘s Republic (DPR) and Lugansk People’s Republic (LPR) are the heart of the documentary. A team of six persons worked on Spring in Donbas for a year. It is characteristic of all involved in the film that they were motivated by the wish to report on facts and circumstances saved purposefully from the Bulgarian and European audiences. The team worked voluntarily and the production is financially and technically completely independent. In this way Spring in Donbass was produced as a reporting film and a documentary with duration of 88 minutes. The documentary begins with a brief timeline of the events in the period 2013 – 2016. Then the reports and interviews with people from Donetsk, Makeevka, Gorlovka, Lugansk follow. The documentary concerns various issues. Indigenous people of different professions tell how Ukraine started the war against Donbass. They reveal how is life under the conditions of continuous and unforeseeable bombardments of their homes, schools and hospitals by the Ukrainian army. War stories are revealed also by representatives of the army of indigenous voluneers. War victims are not only the indigenous people but the Ukrainian soldiers as well who were called up forcibly and sent to fight against Donbass by the new pro European government. It is evident that the Organization for Security and Co-operation in Europe (OSCE) does not work on the implementation of the official Agreement known as Minsk II. The team of the documentary documents the results from the bombardments of the civilians, made in breach of the Agreement. The end of the documentary is optimistic and this is the optimism of the indiginal people that they are on the right way and will achieve a better future. They are convinced of having the power to build a fairer society for themselves and their children. The team rented a private cinema hall for the first night on the 31 of October, 2017 in Sofia. The cinema hall management refused to show the documentary two days before the first night. The ticket sale was stopped and the documentary cancelled from the cinema programme. It was explained by the cinema management that the Embassy of Ukraine in Bulgaria had contacted the Ministry of Culture and requested the documentary show to be cancelled. The Ministry of Culture exerted pressure on the cinema management accordingly. The documentary team refused decisively to comply with this cynical attempt at censorship. 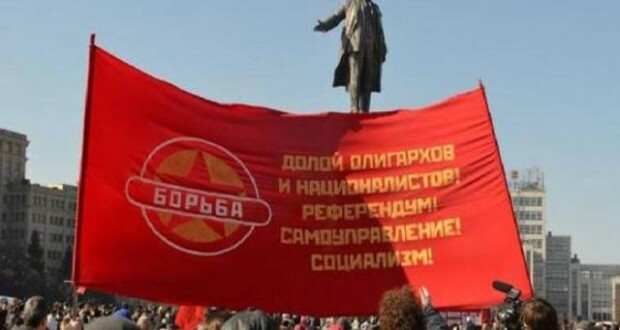 The documentary makers of Spring in Donbass appealed to the spectators through media to come to the first night and not to give up their right of information and culture. A few honest journalists and the Union of Bulgarian Journalists were the first to react in support of the documentary. The Ministry of Culture denied officially its pressure. Indignant spectators came to the cinema for the first night and thanks to their pressure, the documentary was released. So the attempt of censorship failed. 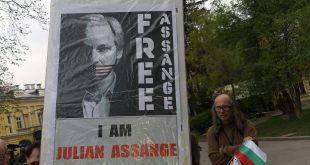 The public interest in the documentary increased and it was clear that the Ukrainian government had something to conceal as it tried to hinder the show of a documentary in a foreign country. Then followed the second show in another cinema hall of Sofia and even more people came. This time there were no attempts to disturb the show. The public comments on the documentary were entirely positive. After this start of Spring in Donbass, many offers for the documentary to be shown were received from all over the country. The documentary team accepted these invitations and started on a long documentary tour covering more than four thousand kilometres. More than ten cities and towns were visited such as Varna, Plovdiv, Russe, Pleven, Vidin, Dobrich, Haskovo, Harmanli, Batak, Elin Pelin, Kyustendil within three months. The documentary distribution became a mass cause. The documentary makers were welcomed and the free shows were expected with interest. Funds were raised to cover the team travelling expenses and about 1 800 BGN was donated and the sum spent was a little above 2 000 BGN. Thus the travellings were financed by the spectators themselves. More than 1 000 people have seen the documentary until now. Discussions were carried out after each show and many opinions were heard that the war against Donbass must stop. There was a disapproval of the support of the Bulgarian governments of the authority actions in Kiev. The disapproval comes from the fact that imposing large scale censorship and disinformation with the aim of hiding crimes against humanity and peace is possible in the „free“ and „democratic“ European Union. Most of the spectators observe with anxiety the activities of fascism in Ukraine and consider them a danger throughout Europe. The team is happy and grateful that the documentary was highly appreciated by the spectators during the shows. The documentary will be uploaded in Internet for free watching in the nearest future. The purpose is to enable as many people as possible to see what is happening in Donbass and Ukraine. We believe that our fight against the war and for social justice is a common fight. The desired results of this struggle could be achieved by means of culture and with the support of most of the people.